Regardless of the team you pick, if you follow either Duffy or Stoffer this year, it’ll cost you over $100,000. Why was Duffy singled out by the Team CP and by Team Stoffer? Stoffer’s team bus is just as plush, but Team CP shouldn’t just swing at lob balls served up by Team Stoffer, that’s just bush league. On Wednesday, July 8, 2009, the Telegraph-Journal published a story about the funeral mass celebrating the life of former Governor-General Romeo LeBlanc that was inaccurate and should not have been published. We pride ourselves in maintaining high standards of journalism and ethical reporting, and regret this was not followed in this case. The story stated that a senior Roman Catholic priest in New Brunswick had demanded that the Prime Minister’s Office explain what happened to the communion wafer which was handed to Prime Minister Harper during the celebration of communion at the funeral mass. The story also said that during the communion celebration, the Prime Minister “slipped the thin wafer that Catholics call ‘the host’ into his jacket pocket”. There was no credible support for these statements of fact at the time this article was published, nor is the Telegraph-Journal aware of any credible support for these statements now. Our reporters Rob Linke and Adam Huras, who wrote the story reporting on the funeral, did not include these statements in the version of the story that they wrote. In the editing process, these statements were added without the knowledge of the reporters and without any credible support for them. The Telegraph-Journal sincerely apologizes to the Prime Minister for the harm that this inaccurate story has caused. We also apologize to reporters Rob Linke and Adam Huras and to our readers for our failure to meet our own standards of responsible journalism and accuracy in reporting. A senior New Brunswick Roman Catholic priest is demanding the Prime Minister’s Office explain what happened to the sacramental communion wafer Stephen Harper was given at Roméo LeBlanc’s funeral mass. During communion at the solemn and dignified service held last Friday in Memramcook for the former governor general, the prime minister slipped the thin wafer that Catholics call “the host” into his jacket pocket. In Catholic understanding, the host – once consecrated by a priest for the Eucharist – becomes the body and blood of Jesus Christ. It is crucial that the small wafer be consumed when it is received. Monsignor Brian Henneberry, vicar general and chancellor in the Diocese of Saint John, wants to know whether the prime minister consumed the host and, if not, what happened to it. If Harper accepted the host but did not consume it, “it’s worse than a faux pas, it’s a scandal from the Catholic point of view,” he said. Henneberry said a statement from the Prime Minister’s Office is in order. On Friday, during the mass, Harper reached out with his right hand and accepted the wafer from a priest. A television camera lingered long enough to show New Brunswick Lt.-Gov. Herménégilde Chiasson, the next person to receive the host, raise his to his mouth. But the tape shows that Harper does not consume the wafer before the camera cuts away several seconds later. Harper and his senior spokespersons were en route to Italy on Tuesday for the G8 leaders’ summit. Harper will spend five days in Italy and on Saturday he has an audience with Pope Benedict. 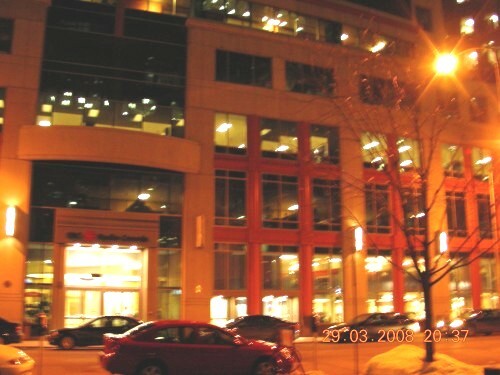 Requests for comment left with Harper’s media office were not immediately returned on Tuesday. What Harper did or didn’t do at the ceremony quietly raised questions at the ceremony in Memramcook Friday. When Harper took the host, “everybody just paused and said, ‘What did he do with it? '”?” said one official who watched the pool feed with reporters who were not inside St. Thomas Church in Memramcook. 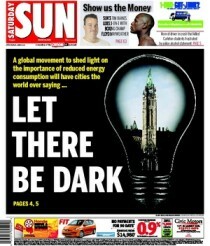 The curiosity among Catholics has not gone unnoticed among Liberal insiders in Ottawa, either. Henneberry said he has received a call on Harper’s actions from a concerned Catholic, and he doubts that she is the only one puzzled and perturbed. “She said she was very upset,” he said, adding he had not seen the footage. Harper’s religious affiliation raises a separate but related question about his accepting the host: As a Protestant, should he have politely declined it? The fact it was a national event that was televised live likely complicated the situation for everyone – the priests and Harper, Henneberry said. “If the prime minister is not a Catholic, he should not have been receiving communion and if he comes up it places the priest in an awkward position, especially at a national funeral because everyone is watching,” he said. But Rev. Arthur Bourgeois, who delivered the homily, did not have a problem with the prime minister accepting the host. “Usually, to partake in holy communion in the Catholic Church, you have to be a member of it, but if you’re not, exceptionally sometimes at major occasions (it is different),” Bourgeois said. “If you are up there and giving holy communion you are not going to stop and asked everyone if they are Catholic or if they are not Catholic. Monsignor André Richard, who is Bishop of the Diocese of Moncton, gave Harper communion but said he didn’t see what Harper did with the host. Bourgeois said it is acceptable to decline the host by simply folding one’s hands, which signals the priest to bless the person. Rev. James Weisgerber, president of the Canadian Conference of Catholic Bishops and archbishop of Winnipeg, said if Harper was not given good advice before the ceremony about what to do, it is a regrettable oversight. “I would feel very sorry for the prime minister if he wasn’t informed about what the procedure is,” Weisgerber said. “I would find it terrible if we put him in an embarrassing situation. Harper could have simply consumed the host shortly after he was off-camera; or he could have hesitated because he expected a priest would soon invite everyone to consume the host once everyone present had received it, as occurs in some Protestant churches. His own faith tradition certainly does things differently, says an evangelical Christian journalist who specializes in religion and politics. Lloyd Mackey’s 2005 book The Pilgrimage of Stephen Harper traces Harper’s political and faith journey. Given his church background, Harper might not have known exactly what was expected of him as a Protestant at a Roman Catholic mass, Mackey suggested. “I don’t think by himself as a Protestant adherent he’d be aware of the nuances,” said Mackey, who added there would be people in his inner circle who should have advised him. For a number of years, in Calgary and in Ottawa, Harper has worshipped at churches within the Christian and Missionary Alliance, said Mackey. Communion in Alliance churches is typically held once a month. It would involve the seated congregation passing along wafers and, in small individual glasses, unfermented grape juice. Harper grew up in a background with United Church of Canada and Presbyterian influences, but he was something of a skeptic until he was a young adult. Mackey’s book says Harper’s journey to a committed personal faith was influenced by fellow politician Preston Manning, among others, and came after reading much-admired Christian apologists C.S. Lewis and Malcolm Muggeridge. LeBlanc, 81, died in late June. He had been the country’s first Acadian and Maritime governor general, and before that, a senator, MP and press secretary to two prime ministers. I’ve learned from a source close to one of the journalists that at least one of them may have gone so far as to seek advice and consider a lawsuit against the newspaper if the paper did not retract the story and absolve (no pun intended) the journalists of fabricating a significant portion the article. Printing such a false hit piece can get a journalist frozen out of any future access to the PMO under the current administration. It’s a rare sight to see journalists defend their integrity against their senior management in the newsroom, however, in this case it may have been a matter of professional self-preservation. What motivation was there behind torquing over three quarters of the story? Did somebody in Ottawa (or Toronto) pick up the phone and push a more interesting story to the editors instead? Some observers will remember that “Wafergate” led CBC’s flagship newscast The National rather than the story about the Prime Minister’s participation in the G8 conference. UPDATE: Errr… this observer didn’t seem to remember correctly. My friends from CBC (yes, I shockingly still do have a couple of them — and they’ve been better to me than I have to them lately, but I digress) inform me that I am mistaken by the order of their reports (they did G8 and did “Wafergate” later in the broadcast). I also mistakenly made this reference on the Charles Adler show. I ironically acknowledge this and regret these errors. When Prime Minister Stephen Harper described last Fall’s stock market dive as “a great buying opportunity,” it was seen by many as a bit insensitive, given the number of Canadians who had just seen a good chunk of their retirement savings melt away. On Feb.10, when the S&P/TSX hit 8,817.89 – one of the lower points since Harper’s comments – an anonymous tech savvy individual registered the web address and created the Harperdex, which set out to track how much the $1,000 invested the day after Harper’s comments would be worth. But stock markets are like public opinion polls and what goes down eventually goes up again. At noon today, the Harperdex shows that $1,000 is now worth $1,003 – probably not what the creator of the Harperdex had in mind. Oh, Liz… you presume too much! Ottawa Citizen reporter Glen McGregor quickly put up HarperDex.ca (mostly, he says, as a fun exercise in some Web programming techniques). The idea was simple: If you had invested $1,000 in the S&P/TSX Composite Index the day after Harper said “Buy”, the HarperDex will tell you what that $1,000 is worth. It’s good to see that the Liberals are getting some help creating anti-Harper mini-sites. Now, if only we could find out which journalist is moonlighting as Perez Hudak? On Friday, I sent out an email to the tens of thousands on the Rally for Canada email list asking them to participate in a small survey concerning the upcoming federal budget.? I asked people four questions concerning the government spending and their public policy priorities.? Over three thousand people responded on Friday and over the weekend.? I will be passing on the results to the office of the Minister of Finance as promised. Some notes: “n” is the number of respondents to each question.? Data was gathered from 8am Friday through midnight Sunday night.? 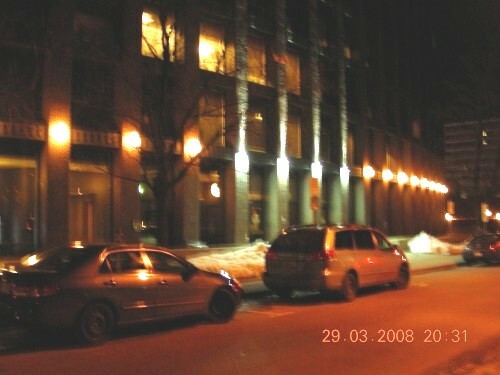 Sample data is gathered from a population set that registered on the anti-coalition website RallyforCanada.ca between December 4th 2008 and January 9th 2009.? Answers were not randomly cycled. That said, this data gives us insight into the priorities of Canadians who are against the concept of a Bloc-supported NDP-Liberal coalition government.? The first question was a careful balance on both sides of the spending vs. taxes debate.? On one hand, the answer set does not include an option to decrease spending and on the other, four out of five answers prompt at least some tax relief.? Most analysts believe that the federal budget will include some tax relief and stimulus in the form of government spending.? The largest group believed a balance spending/tax relief approach would be best while the second largest group favours substantial tax relief and no new spending (given the options presented). The second question had 24 options.? Each option was a yes/no checkbox to pick public policy priorities.? There was little surprise on the distribution of public policy interests as the generally right-of-centre respondents selected jobs, economy, crime, tax cuts, healthcare choice, and military spending as priorities while passing on foreign aid, culture and arts, and native affairs.? Wheat board reform is generally a conservative priority yet this question is likely too regional for a national survey. On the specific questions, it is of particular interest that 90% of respondents believe that the Senate in it’s current form must change.? Only 10% of respondents thought that the Senate ought to be left as it is.? On the question of spending for a particular budget item, respondents indicated that funding for the CBC should be decreased (61%) while only 6% thought it should be increased. WASHINGTON (CP) – U.S. Secretary of State Condoleezza Rice says American officials are reviewing the status of Maher Arar. As I prepared this post, a rerun of the CBC’s fifth estate documentary was lamenting the arrival of that “loud”, “raucous” cable news channel that has debuted on Canadian digital cable. I am, of course, talking about Fox News. Bob McKeown has an obvious thesis. He claims, quite correctly, that Fox News has aided in the division of the United States into Red and Blue. He calls it “a very un-civil war”. Ironically he uses Al Franken and his Air America to confirm his thesis that Fox News is conservative (and thus quite evil). Yet, he ignores that by appealing to Franken he becomes unfaithful to his original thesis of media division of opinion as unfavorable. I’d venture to guess that Bob took a lot of notes when he saw the Democratic Party funded documentary on Fox News: Outfoxed. All of the points were there. If I produced Outfoxed, I’d look into suing the Fifth Estate for plagiarism. There is something quite ironic about the Canadian Broadcasting Corporation identifying media bias when the American news channel itself will compete directly with CBC for viewers. So, I decided to look into the political influence behind what may direct the decisions at the CBC, from the stories that they choose to cover to which rerun of the Antiques Roadshow they’ll play on Newsworld whenever the Conservative Party gets together at a convention or leadership debate. 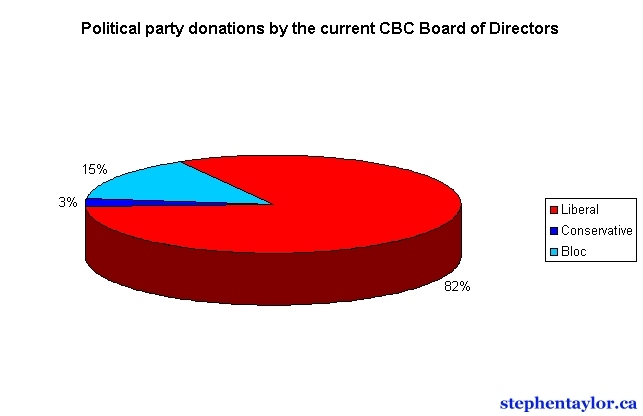 Thus, I present the political contributions by party made by the current CBC board of directors. Consider that these powerful positions are appointed by the government and that state media should of course be unbiased. The CBC documentary on Fox News dreads a division of opinion in the news media concerning the stories that are reported, the facts which are selected, and the tone of the broadcast. I would much prefer a “divide” than such a disparity which is as evident as the chart above describes.